What a lovely juxtaposition! Thanks to Justin for posting it. These two works, assigned to the 14th century, are delightful. Although the first one, by de Carrion, is more refined, and the second, attributed to de Tyr, is rather rough hewn, they echo each other perfectly, if not more so (forgive the semantic faux pas, an explanation follows some way below). Look hard and you can find in the rather busy de Tyr, the bottom picture, a knot of crusaders absorbed in their game of chess. In the more resolved de Carrion above a group of knights do the same. But all of them should be doing something else shouldn’t they? Fighting the good fight would be a start. If the consequences of this dereliction of duty were not so grave (letting your castle be sacked, or your camp be spooked) you might see the pictures as a wry joke based on what every schoolboy will tell you: chess was devised as a substitute for war. In these pictures these diverted chess players have taken it literally. Unfortunately, no one has told the enemy, who are able to go about their daily business of wreaking havoc etc. without let or hindrance. Let’s face it; taking your eye off the ball like that could give chess a bad name. Both pictures tell the same story, which is why they sit so well together. They do it, as you can see, using the same formal visual structure. In both the irresponsible players are inside their respective tents on the left. The six characters around the board in de Carrion have counterparts in corresponding positions in de Tyr, even down to the central placing of prominent head wear. 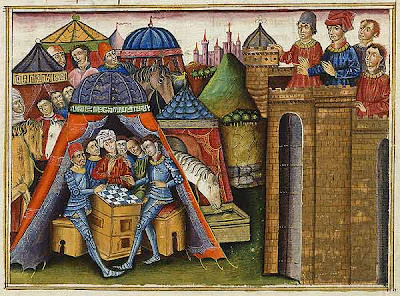 OK, de Tyr has stuffed his tent with a few extras, but de Carrion has found a place for them round the back. In both, the castle on the right is where the artist depicts the awful consequence of an unhealthy obsession with the royal game. This is not a sly joke but a full-on morality tale. Even if the two artists are preaching the same sermon, and use the same pictorial machinery to tell it, there are variations. For example, there is the very modern break-out from the picture frame in de Tyr (though, who knows, maybe it was run of the mill for book illustrators in the 14th century). De Carrion, the better artist with a grasp of perspective and finer detail, declutters his tent so as to focus more tightly on the action within. However, it is what is the same in the two images that is striking; it looks too good to be true; too perfect in fact; too much of a coincidence. 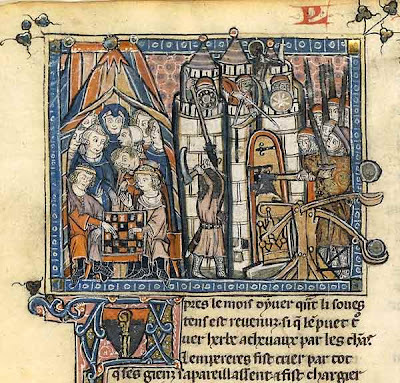 And the explanation begins with what every school boy also knows, namely that Guillaume de Tyr wrote his chronicle of the crusades in the 12th century; so what appears in this 14th century manuscript, dated by the French National Library no less, and they should know, must be a later copy, and thus not by de Tyr’s hand. To continue: de Carrion was a consummate artist, probably a painter to the Spanish court. In those circles it is quite likely that a copy of de Tyr’s original chronicle would have been doing the rounds. Spain had a few Moorish issues at de Carrion’s time (occupation, for starters) so identifying learning points from Crusades a few centuries earlier might save the day. With his privileged access to the court de Carrion would have seen a copy of the illustrated de Tyr. Maybe he even had it to hand when he painted the miniature scene in which he depicted the martial adventures of his patron Chevalier Cifar. Thus, it must be likely that de Carrion borrowed more than a little bit from de Tyr and engaged in a spot of 14th century pictorial plagiarism. Not only was he preaching the same sermon he was painting the same picture. Whatever; we can all agree, can’t we, with the point he wanted to make: careless chess costs lives. A final comment, though not for Chevalier Cifar’s ears. On the evidence of these engaging pictures, it is clear what advice should be given to anyone who wants get away with a quiet game of chess on the battle field: make sure you close the curtains. P.S. I’m off on holiday for a week so won’t see any further comments to this blog till I’m back. Apologies if, in the unlikely event, you might have wanted me to respond further. were castles really small in the 14th century or is that de Carrion can't draw? I await Martin's return from holiday for clarification on this point. In the mean-time - check the collected link! Excellent find Justin, including as it does a pictorial reference to de Tyr!